Mlyňany Arboretum of the Slovak Academy of Sciences manages the largest collection of non-native trees and shrubs in Slovakia, which also happens to be one of the richest collections in Central Europe. 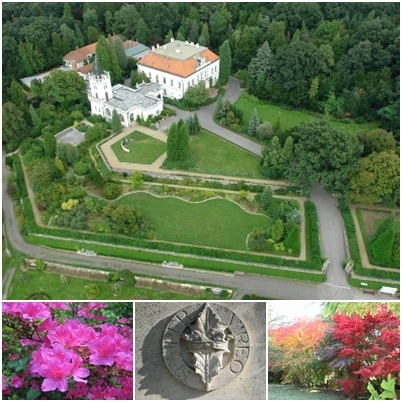 The arboretum was founded in 1892 by Dr. Štefan Ambrózy-Migazzi, an aristocrat originally from Tana (now Tanakajd) in Hungary. His plan to create an Evergreen Park, which he called “Semper Vireo” (“I am always green”), on 40 ha of land, led to the establishment of one of the first large scale plantings of evergreen trees in Central Europe. In 1953 a new project, which is still on-going, was initiated in the park under the auspices of the Slovak Academy of Sciences with Dr. František Benčať as its director. The aim was to expand on Ambrózy’s work in introducing and acclimatizing evergreen trees in his arboretum, by importing as many non-native species as was possible to grow in Slovakia. Many such trees were obtained on expeditions to China in 1960 and North Korea in 1982, 1983 and 1985 and were planted at Mlyňany, being the first of their kind to be grown in the area of what was then Czechoslovakia. Today Mlyňany Arboretum manages a large park, almost 67 ha in extent, which holds a collection of approximately 2000 different trees, mostly varieties of wild species. The trees in the display areas are mainly native to the northern hemisphere with the dendroflora of East Asia predominating. The character of Ambrozy’s original 40 ha Evergreen Park, in which the trees were grouped together regardless of their origin, has been carefully preserved, however, in more recent areas of planting, which includes an East Asian Section (14 ha. ), a North American Section (7.5 ha. ), a Korean Section (5.5 ha.) and a Native Slovak section (c. 4 ha.) the trees have been grouped on phytogeographical principals, in other words, according to their vegetative types and taking into account their natural distribution world-wide and especially their ecological relationships. Besides these geographical sections, which form the primary focus of research, some smaller areas of more specialized interest have also been established, for example, a rose garden and a collection of shrub cultivars. In general the trees in the park have been inserted into the landscape in a way that shows to full advantage their different characteristics as evergreens and the seasonal changes they exhibit. The arrangement in geographically related groups also helps to emphasize specific qualities. In addition to maintaining the park at Mlyňany, the Slovak Academy of Sciences also takes care of the neoclassical mansion built in 1894, which, apart from the administrative area on the first floor, also houses a library, an exhibition room in which the world of trees is illustrated, another room containing memorabilia of the Ambrózy-Migazzi family and some workshops. Beyond the area of the information trails, close to the nurseries for ornamental plants there are also some outbuildings which are used as laboratories and contain a centre for park operations as well as storerooms. The land occupied by the arboretum belongs administratively to two neighbouring villages, Vieska nad Žitavou and Tesárske Mlyňany. The picturesque nature of the hilly landscape, which geographically belongs to the foothills of the Pohronský Inovec mountain range, lends itself to the creation of idyllic nooks and crannies. Sinuous paths link the various sections of the arboretum and here and there little lakes, adorned by architectural structures, add to the enchantment of the whole area. Mlyňany Arboretum is open to the public throughout the year except on certain holy days.